Ancient Lenape Legend tells of when Snow Spirit entered the World. The animals soon began to freeze, and all would perish if something was not done. They decided to send a messenger to Kijiamuh Ka’ong, the Creator Who Creates By Thinking What Will Be, to ask him to think the world warm again so that Snow Spirit would leave them in peace. Rainbow Crow, the most beautiful of all the birds, with shimmering feathers of rainbow hues and an enchanting singing voice, was thus chosen to go. It was a difficult journey, and he flew upward into the heavens, beyond the sun and moon, above even the stars. When Rainbow Crow reached the Holy Place, he called out to the Creator, but received no answer, so he began to sing his most beautiful song. The Creator was drawn from his thoughts by the lovely sound, and greeted Rainbow Crow kindly, asking what gift he could give the noble bird in exchange for his song. Rainbow Crow asked the Creator to un-think the snow, so that the animals of Earth would not be buried and freeze to death, but the Creator told him that the snow and the ice had spirits of their own and could not be destroyed. The Creator stuck a large stick into the sun. The end blazed with a glowing fire that burned brightly and gave off heat. Handing Rainbow Crow the cool end of the stick, he told him to hurry back to Earth before it could completely burn up. Rainbow Crow thanked the Creator, and flew as fast as he could. As he descended, the Fire grew hot as it came closer to his feathers, and soon his whole body was black with soot. The smoke and heat got into his throat, strangling his beautiful singing voice. By the time Rainbow Crow landed among the freezing cold animals of Earth, he was black as tar and could only Caw instead of sing. He delivered Fire to the animals, which warmed them and rescued the littlest animals from the snow drifts where they lay buried. It was a time of rejoicing, for Fire had come to Earth, but Rainbow Crow sat apart, saddened by his dull, ugly feathers and his rasping voice. He felt the touch of wind on his face and saw the Creator walking toward him. Crow is a harbinger of change; she announces newness on the horizon. Crows are the Sentinels, known for their tendency to observe all around them and alert other crows of danger, which can teach us to be watchful about what we believe and our automatic judgments of others, and to test our habitual ideas about reality against a more universal standard. They have been given the task of Messenger of the Ancestors, and follow the pattern to observe, make note, translate, and share. Crow reminds us to learn to trust our intuition and personal integrity, to create our own standards, and to know ourselves beyond the limitations of one-dimensional thinking and laws. Crow represents the elements of change in our lives, allowing us to simultaneously see the past, present, and future, and merging the dualities of darkness and light, of our inner and outer Beings. 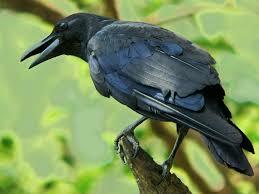 In Mayan culture, the Crow is a privileged being because it is cross-eyed, seeing both sides of reality at once. By indicating the need to find balance and to stay in the present, Crow will bring us the ability to release past beliefs. Those who have Crow by her side have the role of carrying souls lost in pain, denial, bitterness or ill intent, into the light of forgiveness and self-awareness. To assist in this process, Crow Souls have been blessed with the ability of keen perception, to see right to the core of their own Self. Whether this is turned within to gain understanding of oneself, or reflected back as a mirror to others so they may know themselves, this is a beautiful gift. Crow Souls often feel disconnected early in life and are seeking connection. Communication is an integral part of their path, and they are here to express the depth of what they feel, to invoke understanding and inspire others to reach for the light within them so that true healing may occur. Yet Crow Soul is one who struggles to find and define herself, spending much time gradually coming to an understanding and embracing of all the facets that make up their Personality, Mind, and Soul. Uncovering the “shadows” within ourselves – the areas that represent our greatest lessons and opportunities for growth – and then working to understand and integrate them, allows the soul to mirror Rainbow Crow’s journey. Dwelling in two worlds, earth and sky, Crow teaches us how to shed the feelings of disconnect that exist throughout our physical lives as we move toward deeper levels of understanding, and then to share this insight with others through our words. When Crow came to me, I was working to expand my expression. I wanted to release patterns of not expressing love, of not communicating emotions and thoughts out of fear, which, in turn, had been mirrored in relationships where love and truth had not been fully expressed back to me. I was seeking interconnectedness. Crow is an omen of transformation, and a signal to be mindful. Learn from the past and move on; there is no longer a need to fear expression, but to recognize the divine purpose of all things. It is time to look beyond my present range of vision, recognize the gifts I have been given that I have not yet developed, and help others step out from the darkness and into the light of healing.